Don’t forget to submit your Coffee Chat links! 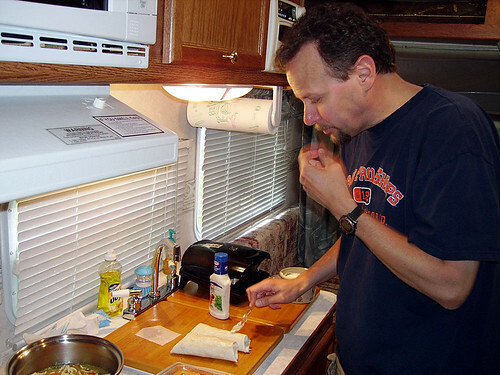 My husband, making us turkey/spinach wraps and chicken soup in our camper. When the accounting gig wears thin, he could always be a chef. He can cook some seriously AWESOME stuff – he just eyeballs it and rarely uses a recipe. I’m completely useless in that department. Parents want their kids to excel in school, and they’ve heard about the illegal use of stimulants such as Ritalin and Adderall for “academic doping.” Hoping to obtain the drugs legally, they pressure pediatricians for them. Some even request the drugs after openly admitting they don’t believe their child has ADHD…. “I spoke with [some] colleagues the other day and they mentioned three cases recently where parents blatantly asked for the medication so that their children would perform better in school, yet there were no other indications that the child had ADHD,” says Dr. Nick Yates, a pediatrician and director of medical ethics for Mercy Hospital in Buffalo, N.Y. Academic doping — using these stimulant prescriptions in an effort to enhance focus, concentration and mental stamina — first started on college campuses, especially Ivy League and exclusive, competitive schools. Now, the problem is filtering down to secondary schools, Yates says, and more parents are playing a role in obtaining prescription ADHD medication for their teenagers. Wow. That is off-the-charts crazy. Do you think this is still going on today? Or do you think doctors are more careful about testing for ADD/ADHD nowadays? I’m disturbed to think that parents would be desperate (competitive?) enough to subject their children to drugs just so their ACT scores were more impressive. Though to play the devil’s advocate, I can sort of UNDERSTAND the temptation to go down this road when so much rides on the kids performing well so they can get into a decent school. (Though I would never, ever, force my kids to take drugs – for any reason). And I’m not quite sure I buy the ADHD “disease” either. Though I understand there are children out there that have a chemical imbalance, I think it’s more the exception than the rule. They tried to convince me that he was ADHD and needed to be medicated. And then one of the teachers went on to say she recognized MK’s “symptoms” because her son behaved the same way and he had ADHD. I was livid. I knew my son was not ADHD. He’s highly intelligent and pretty emotional but I think that’s where the similarities ended. I looked them straight in the eye, thanked them for the concern and then told them, in no uncertain terms that he wasn’t ADHD and I had no intention of having him tested. MK had one more “temper tantrum” in class which landed both of us in the principal’s office because of his disruptive behavior. The principal tried to let him off with a warning (because I did their website and he felt bad for me), but I insisted he follow the normal school rules – in-school suspension (ISS) for one day (this being his first offense). MK went to ISS, and was extremely embarrassed of his behavior. We had a long, long, LONG, stern, honest talk about him and his tantrums and I flat out told him to straighten up and grow up. He was too old to act like a five-year old. He did indeed grow up after that experience because he learned that there are consequences to his actions – he’s been a model student (and kid) ever since. He wasn’t ADHD, he was simply immature and allowed his emotions to take him over. The teachers never really treated me the same after that. What do you think? Do you think parents fool doctors into thinking their children are ADD/ADHD so they can get drugs that will help their children perform better at school? Or do you think these are just isolated cases and most times an ADD/ADHD diagnoses is justified? 2. What advice do you have for a new blogger? Be specific – this new blogger? Wants to know details! 4. What is your greatest consumer mistake, something that you are shaking your head at now, saying, “Boy, I wish I wouldn’t have bought _____”? So, why did you buy it? What happened to it?